Bienvenue à Sunflower au magnifique Bradenton Beach Club! Juste en face de la plage avec deux piscines chauffées que nos clients peuvent utiliser pendant leurs vacances au paradis! Cette unité spacieuse est joliment meublée avec un mobilier confortable et un décor mis à jour. Détendez-vous dans le salon et regardez votre émission préférée ou le réseau Wi-Fi gratuit fourni. Faites comme chez vous avec la cuisine entièrement équipée avec lave-vaisselle. Savourez un copieux petit-déjeuner au bar du petit-déjeuner tout en planifiant votre journée ou préparez votre prise de la journée pour le dîner et profitez-en en famille à la grande table! La chambre principale dispose d'un lit queen-size confortable et d'une grande salle de bains pour laver toute l'eau salée à la fin de la journée. La deuxième chambre a un ensemble de lits jumeaux et une tanière offre un lit superposé confortable. Profitez pleinement d'un balcon privé avec moustiquaire situé dans le salon. parfait pour jouer aux cartes ou tout simplement en sirotant un verre de vin après une journée ensoleillée! Laveuse et sécheuse, tous les draps et serviettes de plage sont fournis. Le complexe s'étend de Gulf Beach à un ravissant quai sur la baie! Venez voir les couchers de soleil, vous reviendrez encore et encore! Profitez de la sensation de sable entre vos orteils, ramassez des coquillages ou observez les dauphins du rivage! Florida Dreams Realty of AMI, Inc. It was good, plenty of room. Some improvements could be made to make it great. The bunk bed was unsafe, it squeaked and bolts were all lose. Did not feel safe so my daughter slept on the couch which wasn&#x2019;t ideal. The couch could use replacing could feel the springs while sitting on them. Floors could use a good cleaning, feet were black after walking on them with bare feet. The 2 pools is a little deceiving, pool at beach is big enough for seriously 2 people. Location was good was within walking distance to shopping and restaurants. Overall it was a good vacation and this condo was nice, washer/dryer and kitchen was very convenient. This was our first time at Sunflower, but not our last. The condo is spacious, clean, well equipped and very conveniently located. I missed having a barbecue available, and a couple of lounge chairs would be nice on the lanai. The condo overlooks the service area, screened by plantings, of the neighboring complex so noise was an issue at times. We have stayed at the Sunflower condo a few times before and have had great experiences, but this one wasn&#x2019;t so great. When we checked into the condo on Saturday, we found that it had an ant problem. There were tiny ants EVERYWHERE in the kitchen and some in the bathroom. Anything that you sat on the counter was instantly covered so we had to stuff the fridge and kitchen table with all of the groceries we bought since they couldn&#x2019;t be on the counters and ordered pizza for dinner since we couldn&#x2019;t cook. We immediately called the emergency maintenance number around 7:00-7:30pm and called the owners number when we didn&#x2019;t get a response back from the maintenance in 10 minutes like the condos handbook stated. We called multiple times after not receiving any calls back. We did not hear back from the &#x201C;emergency maintenance&#x201D; until 10:30 pm. Suzy returned our call and was everything, but pleasant. She told us to spray hairspray on the kitchen counters and that it was too late to deal with the issue when my husband asked when we would hear back from her or the owners and then she proceeded to hang up on him. The owner came over the next morning to check out the issue and told us that he knew of the issue and thought that it had been resolved. He upgraded us to a house for the rest of the week, but the first two days of our vacation were ruined. We spent our first evening trying to avoid the ants that had taken over the kitchen and getting ahold of the rental company and the next afternoon was spent packing up our condo and all of the groceries we bought for the week to move it to the northern end of the island. We did have a good week once we were settled, but we were very disappointed in how the trip began. Hi Lauren, We appreciate you taking the time to write a review, however, we would have preferred that the story been told truthfully. There was a problem with ants, no doubts, but this can happen in Florida. We never hang up on someone. You were insisting getting an exact time for pest control to get to the property to assess the ant problem you reported. This was not possible that's why Suzy finally said "I now need to hung up". We hope you thoroughly enjoyed the extravagant upgrade you received the next morning at no additional cost. My family and I enjoyed our vacation. The decor in this condo was very nice, included many extra&#x2019;s such as beach towels, chairs and toys. It is very important to us that the unit be CLEAN and it was! It was unfortunate that the tenants before us didn&#x2019;t leave the sand at the beach so we had to wait (at the pool) longer to get into the condo. The woman cleaning it was very nice, letting us use the bathroom while she was working. It was spotless when she left and we appreciated her professionalism. 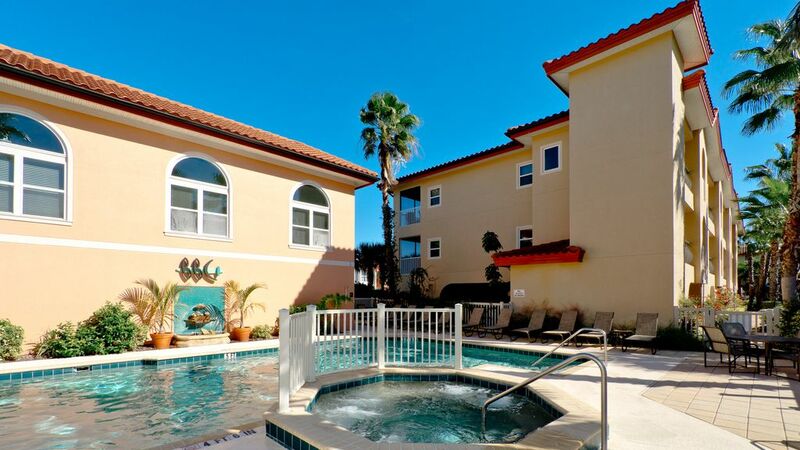 The pools were great and it is the first unit off the street so access to the beach was convenient. It is near restaurants and shops so we walked everywhere we went. Parking was convenient, right below the unit so we used the steps to the 1st floor. There is an elevator at the other end of the building that my handicapped Mother used. The only reason we wouldn&#x2019;t stay there again is that there is no view, only of the parking next door but that is why the cost is less than directly on the beach.